Storm Armor in action. Such as it is. Storm Armor is a Conjuration Wizard skill unlocked at Level 17, shocking anyone in range of the Wizard. Storm Armor provides additional lightning damage that hits attackers automatically. It does not provide a defensive bonus to the Wizard, just another form of damage that generally activates only when the Wizard is hit. Some of the rune effects assist with other minor buffs. Lacking physical armor, a Wizard needs magical protection in dangerous places. The Wizard weaves herself with electric energies that discharge if an enemy attacks her. Refer to the Storm Armor rune effects article for thorough descriptions of all five rune effects in this skill, including screenshots, videos, strategy tips, and other related information. This defensive skill shocks nearby enemies with lightning damage at seemingly irregular intervals. Also note that lightning critical hits will stun enemies, which would make this a lot more useful as a defensive spell, if the Wizard has a high chance to land a critical hit with spells (specifically lightning spells). ...no one was bothering much with defensive skills at Blizzcon; not in the short time we had to play, and the small dungeon we had to clear out. I didn’t test out this one, but it sounds like a fairly interesting skill. It’s somewhat misleading in name, since the description doesn’t mention any defensive properties; just that it fires out lightning bolts at nearby enemies. It was seen again at BlizzCon 2009, but as a Tier V skill, it was too high level to try out. Skill tiers were removed for the July 2011 Press Event, allowing skills to unlock steadily from levels 1 to 30. Consequently, all skill levels were adjusted and Storm Armor became a level 13 skill. Just how the game defines “attackers” is not clear; I used this for a while and sometimes saw it hit monsters that I thought were not yet in melee range, while at other times it very slow to trigger even when I was getting swarmed. It’s hard to tell though, since the graphic for the shock it delivers to enemy monsters is very inadequate. It just gives them a little charge near the feet, almost like the Charged Bolt graphic from Diablo I. That’s very easy to miss if there’s a pack of enemies, much less if the Wizard is using lightning spells at the same time. With the Patch 13 changes, Storm Armor was classified as a Conjuration skill and bumped up to level 17, moving it out of reach in the beta. See the Wizard skill archive for more details on previous versions of Storm Armor and other Wizard skills. 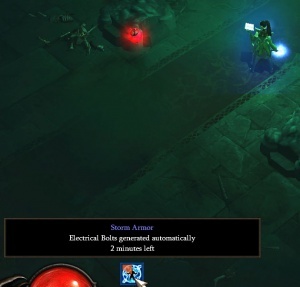 Storm Armor's operation is similar to Diablo II's Sorceress skill Thunder Storm, but there’s a key difference. While that (highly useful) skill zapped some random enemy with lightning once per second, Storm Armor only hits enemies that are attacking her. This page was last edited on 16 April 2015, at 18:01.